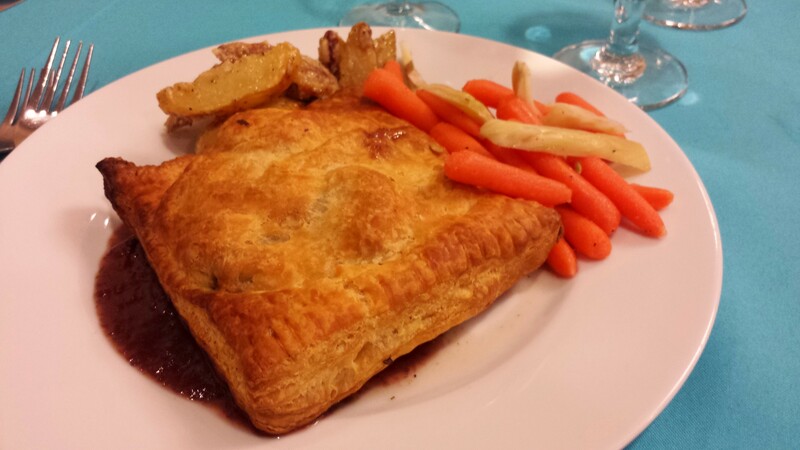 This recipe was served at our 2015 Annual Banquet. For the “beef” in the recipe, we used The Herbivorous Butcher’s vegan ribs without the usual sauce. You can use a mock meat of your choice, but depending on what type of mock beef you are using, you may want marinate it first to add flavor. In a dry skillet over medium heat, cook the shallot and mushrooms until tender and all liquid has evaporated. Stir in the dried tarragon and add the salt and black pepper to taste. Set aside to cool. Carefully unfold a single sheet of the puff pastry. Place the four pieces of mock beef on the pastry, leaving at least 3/4 inch around each piece. (For each serving of mock meat, 3 inches x 4 inches x 1 inch works well.) Cover the mock beef with a piece of mock bacon and a small spoonful of the mushroom mixture. Top with a second sheet of the puff pastry. Press down gently between the pieces of beef so that the two sheets come together. Cut the dough into individual servings and then gently crimp the edges with a fork to seal. Place the pastries on a baking sheet and bake about 20 minutes, or until the puff pastry is golden brown.